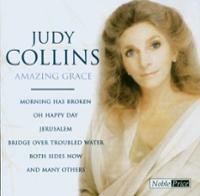 Amazing Grace is an album by Judy Collins, released in 1985 by the UK record label Telstar. It was her first album after ending her 24-year association with Elektra and was recorded and released in 1985 in the UK as a Christmas offering. It has only been available in the United States as an import, although seven of the tracks can be found on her 1987 US release from Gold Castle, Trust Your Heart. At 16 tracks and nearly an hour in duration, this was Collins' longest album to date. It is the first album the artist had released where she has recorded covers of songs that could be considered the "signature songs" of several other artists, including Simon and Garfunkel, Joni Mitchell, Bette Midler and Cat Stevens.